HELLO CJSKETOKITCHEN FAM! This week we bring you another delicious recipe. This weeks recipe is a Low Carb Carrot cake! Yes, we said Low Carb Carrot cake. This recipe is part of our special set of recipes for Easter, but this would be a great recipe for any special occasion such as a birthday, anniversary, bridal shower… Carrots are traditional for Easter. So before you get all up in arms about using Carrots and Keto, we know that carrots is not considered a keto friendly vegetable. That’s why we aren’t trying to portray this as a Keto dessert. However, if eaten in moderation and factored into your daily macros it is a desert that someone doing keto can enjoy. We aren’t telling you to eat this everyday, nor are we saying you need to make this and eat it all yourself (but that is ultimately your call). We have lived the Keto lifestyle daily, 24/7/365 for the last 3 years and have no plans on stopping. We also practice fasting regularly both intermittent and extended day from time to time. 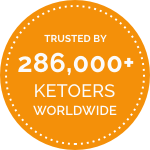 So Keto for us is truly a lifestyle! So why make this recipe for others to use? Because we want to give you options. Recently we received a comment from one of our regular YouTube viewers discussing the difficulties of doing keto solo and doing family events (we love and appreciate you Vickie!) We discussed this and one of the strategies we use in this situation is we take our own food/desserts. We do this because we know that we can still participate but also have something that we can enjoy. Is this extra work!? Yes! But we are serious about this lifestyle and do what we need to do. I took some of this cake to my office and shared it with a co-worker and she raved about how good it was (this person is not doing keto). So this recipe if taken to a family event i warn you that you may not even get a piece, because the carbivores (people not doing keto) will eat it all. Here is a little perspective for you about carbs. A 4 ounce piece of a Costco Carrot cakes comes in at 50 grams of carbs. This low carb version comes in with 4 net carbs per slice. This weeks recipe is a Low Carb Carrot cake! Yes, we said Low Carb Carrot cake. If eaten in moderation and factored into your daily macros it is a desert that someone doing keto can enjoy. Grease both the bottom and side of your two 9 inch pans, line the cake pans with parchment paper. Begin adding your 5 eggs. Add one egg at a time, and mix in between each egg. Add 1/2 cup of heavy whipping cream and mix well. Add your freshly grated carrots and mix well, until fully combined. In another bowl combine your almond flour, baking powder and spices. Add the your dry ingredients to the wet ingredients a small amount at a time and mix well. Stir in your chopped walnuts and unsweetened shredded coconut. *We suggest you stir in only 1/3 of your nuts and reserve some to use in topping your carrot cake. Transfer your batter evenly between the your two cake pans. Bake for 35 minutes or until you insert a knife and it comes out cleanly. Mix on high speed your softened cream cheese and butter until light and fluffy. Scrap your bowl often as you mix. for the best results use a whipping attachment if possible. Next add your powdered natural sweetener a little at a time and continue to mix in. Add in (drizzle) your heavy hipping cream a little at a time and continue to mix. After cakes have cooled completely (we suggest using a cooling rake). Place the first layer on a cake plate and begin frosting your cake. Starting from the center outward. Sprinkle remainder of nuts on top of the cake for presentation. This is a new section that hopefully we can begin doing every week. This will be a section where we highlight older recipes from YouTube and here on the blog. This weeks recipe is Blueberry Swirl Cheesecake.